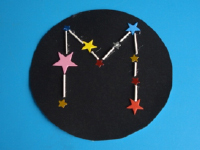 Children will love creating a constellation that represents the first letter of their name. 1. Gather your materials. You will need black construction paper, cotton swabs, star-shaped stickers and/or adhesive Fun Foam stars, a pencil (not shown), white glue, dark glitter, scissors, and ribbon. 2. 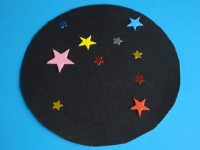 Cut a large circle out of the black construction paper. Use the pencil to trace the first letter of the child's name, making sure not to press too hard. Stick stars along the pencil marks, leaving empty spaces between the stars as shown. 3. 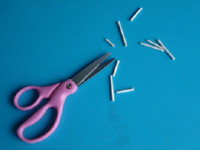 Use the scissors to remove the ends of the cotton swabs. Cut each one into several tiny pieces. 4. 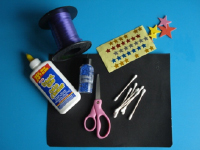 Glue the cotton swab pieces between the stars to connect them and complete your constellation. 5. 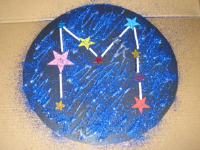 Apply white glue liberally around your constellation and sprinkle glitter all over. Shake any excess glitter off over a garbage can. 6. Use a hole-punch (or your scissors) to make a hole at the top of the black circle. 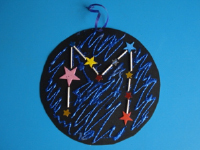 Thread a piece of ribbon through the hole and use it to hang your constellation from the ceiling.